Dorothy Lee Sturgeon, 86, of Frankfort, passed away on Monday, June 5, 2017 in her home. 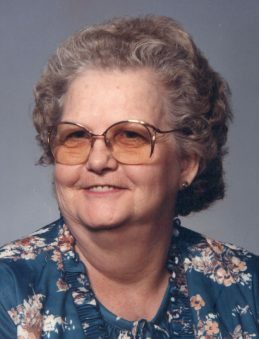 She was born on May 12, 1931 in Colfax, IN to Jesse and Myrtle Jessie (Laffoon) Suter. She married John Frank Sturgeon on May 9, 1953 and he preceded her in death in 1984. She attended Colfax High School and was a cook for Sei’s Café and for Jim Dandy Restaurant. She also worked at National Seal. Dorothy loved sewing, working puzzles, along with making and collecting dolls. Memorial donations may be made in Dorothy’s honor to Community Christian Church or Great Lakes Hospice with envelopes available at the funeral home. A funeral service will be held at 10 a.m. Thursday, June 8, 2017 at Community Christian Church, 1944 S. Jackson Street, Frankfort. Friends may visit from 4-8 p.m. on Wednesday, June 7, 2017 at Archer-Weston Funeral & Cremation Center in Frankfort. Pastor Tim Grasham will officiate. Burial will follow in Plainview Cemetery. Survivors include her Daughters: Kathy (Mike) Brite, Myrtle Ann Sturgeon, and Mary H. Sturgeon; Son: Danny Lee (Sandy) Street all of Frankfort; Step-sons: Lanny Dean Sturgeon of Florida and Larry Joe (Gloria) Sturgeon of West Point; 4 Granddaughters; 3 Great-granddaughters; 1 Great-grandson; and 1 Great-great-granddaughter. In addition to her parents and husband, she was preceded in death by a step-daughter, 3 sisters, and 2 brothers. So sorry for your loss. You are in our thoughts and prayers. Glenn & Chris Greeno. Thank you. I am her great niece Bobbi Smith. Mary Myrtle and family I am so sorry for your loss. I remember your mom always smiling and laughing. My thoughts are with you all. Dorothy was my great aunt. My grand mother Helen’s sister. I was very little the last time I seen her. I will miss very much. To Mary and Myrtle Sorry for the loss of your Mother, may you have peace knowing your friends hold you up in prayers. You probably don’t remember me from Wesley Manor years back, I was an Aide but I remember you guys. Prayers and thoughts are with you as go through this. I am sorry to read of your mother’s death, Danny. She sounds like a nice lady; I’m sure you have lots of good memories of all your times together. My prayers to all of the family. I had the pleasure of knowing Dorothy through Myrtle and Mary when we worked together. She was always so sweet to me and welcomed me when I was around her. I’m thankful to have known her. I loved you DORTHY Sturgeon, and will I see you on the other side. Beautiful wings and all. To your family I’m so sorry for your loss, she was amazing.